Sung by baritone Jamie H. Hall. All praise to Thee, O Lord is by the Anglican clergyman Hyde Wyndham Beadon (1812–1891). 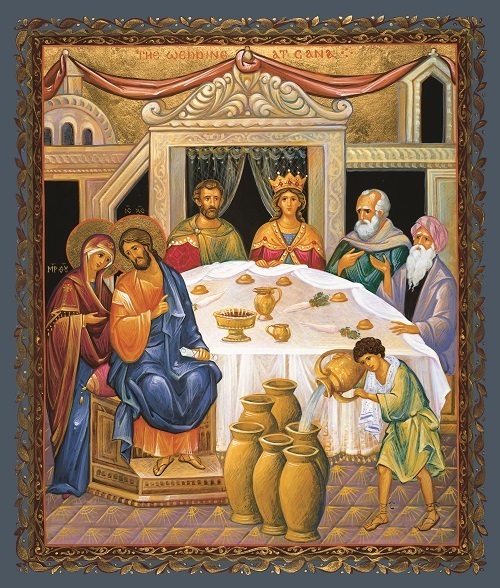 The hymn reflects upon the miracle of Cana. Jesus’ word is creative: it alone changes water into wine. This miracle is a foretaste of the wedding feast of the Lamb, which we both anticipate and participate in when we receive the Eucharist: For by Thy loving hand/ Thy people still are fed;/ Thou art the cup of blessing, Lord,/ And Thou the heavenly bread. The tune ST. THOMAS is by William Williams (1717–1791), a Calvinist Methodist and prolific composer of Welsh hymns. How welcome was the call is by Henry Williams Baker (1821–1877), an Anglican clergyman who also composed the paraphrase of Psalm 23, The King of love my shepherd is. The tune ST. MICHAEL is by Loys “Louis” Bourgeois (c. 1510 – 1559), a French composer and music theorist of the Renaissance. He is most famous as one of the main compilers of Calvinist hymn tunes in the middle of the 16th century. Calvinists’ important contributions to church music, such as the exquisite three-part settings of all 150 psalms (for domestic use!) by the Huguenot Claude Goudimel, are often forgotten. Songs of thankfulness and praise (SALZBURG) is by Christopher Wordsworth (1807—1885), Anglican bishop of Lincoln and nephew of teh poet. The hymn recapitulates the successive manifestations of Christ presented in the preceding weeks and in the original version looks forward to the ultimate epiphany of His second coming. The hymn is typical of Wordsworth’s didactic method, in which each event is marked out (almost as if by a bullet point) by the repeated word manifest and the message is further brought home by the refrain God in man made manifest.